Hi everyone. Figured I'd do the hip new thing and start a blog, since several colleages have suggested it. Can the world handle TWO theropod blogs (*cough* Andrea Cau *cough*)? We'll have to find out. Yeah, it's rather boring looking at the moment, but I'll need to scan through the HTML/XML to add fancy skeletal reconstructions and such. Much of what I post here will end up on The Theropod Database, so don't think I'm giving that site up. But the blog should provide a more continuous source of information, which will also be more informal than what gets posted there. As a first post, let's examine the obscure taxon Embasaurus minax. This theropod was briefly described in Russian by Riabinin back in 1931, then pretty much ignored. Everyone's parroted his Megalosauridae ID, which was based on Huene's not exactly current views from the 1920's. The exception has been The Dinosauria, which made a big deal of its supposed platycoelous centra being similar to Kaijiangosaurus but unlike carnosaurs. Can we do better with today's resources, or will it stay in the trash bin of Theropoda indet.? Below is the figure from Riabinin's paper, with 1 being the dorsal centrum (a anterior, b dorsal, c left lateral, d ventral) and 2 being the cervical centrum (a posterior, b left lateral, c ventral). Diagnosis- (proposed) differs from Xiongguanlong in being over 170% larger and having less steeply angled cervical centra. Previous diagnoses- While not providing a formal diagnosis, Riabinin (1931) distinguished Embasaurus from Dryptosaurus because the latter has shallower ventral concavities on its caudal centra than Embasaurus does on its dorsal centrum (expected when comparing caudals to dorsals), from Spinosaurus due to its non-opisthocoelous centra (a plesiomorphy), from Ceratosaurus due to its supposedly more gently sloping ventral centrum margin and flat articular surfaces (both known in Ceratosaurus), and from Allosaurus for the same reasons plus the much shallower and less angled ventral centrum margin of the dorsal (all of which are similar to mid dorsals of Allosaurus). Comments- The two syntype vertebral centra of Embasaurus were discovered in 1927 and described by Riabinin in 1931. The larger centrum is platycoelous or amphiplatyan, 107% longer than tall, 107% wider than tall, has a ventral concavity 17% of centrum depth, and lacks pleurocoels or a ventral keel. What may be the ventral part of the parapophysis is visible anteriorly. The neural arch is unpreserved and was not fused to the centrum, indicating the individual was not adult. The smaller centrum is missing its anterior end, but its length can be estimated using the posterior width and angle of anterior transverse expansion. While it is much smaller (width ~51% of the larger centrum), this amount of disparity is known between posterior dorsals and anterior cervicals in many theropods (e.g. Majungasaurus). The angle between the posterior articular surface and ventral edge suggests it is a cervical centrum, contra Riabinin. The posterior surface is flat and 64% as wide as tall, with the length estimated at 94% of the height. The ventral surface is keeled along its entire length and there are no pleurocoels preserved, though they may have been present anteriorly. Only the bases of the neural arches are preserved and the centrum interior is hollow. Riabinin (1931) referred Embasaurus to Carnosauria sensu lato based on its size, and to Megalosauridae (also sensu lato, including allosauroids and megalosauroids except Spinosaurus) based on "general form". The few times they've been mentioned since (Nessov, 1995; Currie, 2000) have repeated this possible identification without supporting evidence. Molnar (1990) thought it was primitive due to the platycoelous dorsal centrum and excluded it from Carnosauria sensu Gauthier (allosauroids and tyrannosaurids) because of it, but most of the taxa he viewed as carnosaurs actually do have roughly amphicoelous-amphiplatyan dorsals, besides the anterior dorsals of allosauroids. Embasaurus can be excluded from Ceratosauria based on its lack of a posterior cervical pleurocoel, though it is similar to many in having a ventral keel and flat posterior surface. Megalosaurus itself and other megalosaurids differ in having opisthocoelous cervical centra without a ventral keel, though the posterior dorsal centra are roughly similar. Spinosaurids differ in the same way. Some carcharodontosaurids have ventral keels (e.g. Carcharodontosaurus), but all carnosaurs differ in having opisthocoelous cervical centra. Tyrannosauroids are similar in being large and having non-opisthocoelous cervicals, and the Early Cretaceous basal tyrannosauroid Xiongguanlong is similar in having amphiplatyan cervicals with an elongate ventral keel on at least cervical ten and lacking posterior dorsal pleurocoels. The only obvious difference is that Embasaurus has a less steeply angled ventral edge on its cervical centrum than any cervical of Xiongguanlong and that the subadult Embasaurus individual was 170% larger than the adult Xiongguanlong holotype. Among other tyrannosauroids, Dilong differs in having opisthocoelous cervicals and amphicoelous dorsals that are more elongate, Stokesosaurus differs in having platycoelous or opisthocoelous cervicals and amphicoelous dorsals, and tyrannosaurids themselves lack ventral keels and have entirely pleurocoelous dorsal centra. Therizinosaurs, ornithomimosaurs and oviraptorosaurs sometimes get comparably large and have non-opisthocoelous cervicals, but the first two have ventrally tranversely concave cervical centra, and the first three have elongate cervical vertebrae. Besides Xiongguanlong, the only close resemblence is to basal tetanurines like Condorraptor and Szechuanosaurus? zigongensis, which have platycoelous and keeled cervicals (in at least ~4 and ~10 in Condorraptor and only in 9-10 in zigongensis) along with platycoelous posterior dorsals that lack pleurocoels. These were generally extinct by the Cretaceous, though specimens like Erectopus and the Baharija "Elaphrosaurus" tibiae of Stromer may show they survived long enough for Embasaurus to be a representative. Besides having posteriorly concave cervical centra, Condorraptor differs in having its cervical keels only developed anteriorly as hypapophyses and in lateral view the posteroventral centrum edge is convex in its cervicals. Szechuanosaurus? zigongensis also differs in having posteriorly concave cervical centra, with cervicals nine and ten broader and with more deeply concave ventral edges. In conclusion, Embasaurus is most similar to the basal tyrannosauroid Xiongguanlong, which is also close stratigraphically and geographically. It is less similar to the generally earlier basal tetanurines, so is tentatively referred here to Tyrannosauroidea. Within Tyrannosauroidea, it is more derived than Dilong due to its short dorsal vertebrae but excluded from Tyrannosauridae due to its lack of mid/posterior dorsal pleurocoels. As it differs from all comparable taxa, it is not a nomen dubium as suggested by Molnar and Holtz et al. (2004), neither of whom even compared it critically to other taxa. References- Riabinin, 1931. 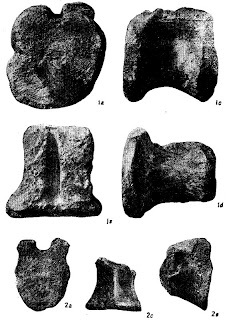 Pozvonki dinozavra iz nizhnego mela Prikaspiyskikh stepey [Two dinosaurian vertebrae from the Lower Cretaceous of the Transcapsian steppes]. Zapiski Rossiyskogo Mineralogicheskogo Obshchestva. 60(2, number 1), 110-113. Molnar, 1990. Problematic Theropoda: "Carnosaurs". in Weishampel, Dodson and Osmolska (eds.). The Dinosauria. University of California Press, Berkeley, Los Angeles, Oxford. 306-317. Currie, 2000. Theropods from the Cretaceous of Mongolia. In Benton, Shishkin, Unwin and Kurochkin (eds). The Age of Dinosaurs in Russia and Mongolia. Cambridge University Press, Cambridge. 434-455. Well, I was not expecting it to be a tyrannosauroid. Anyone who wants a pdf of the description, email me at Mickey_Mortimer111@msn.com. Next up, Poekilopleuron schmidti. Welcome to the blogosphere! How long till you will be assimilated into the ScienceBorg collective? Pozvonki dinozavra iz nizhnego mela Prikaspiyskikh stepey [Two dinosaurian vertebrae from the Lower Cretaceous of the Transcapsian steppes]. The word "two" doesn't occur in the original. Just "vertebrae of a dinosaur". I know the Russian title doesn't have the word two, but the English title that accompanies the English abstract does. Do you happen to know the words prichlenennaya, yamchata, vyvetrelaya, razloman or tulovishchnykh? All things Babelfish didn't know. Looking forward to *Poikilopleuron* too, I've heard that that one's poorly known. Great start to what will obviously be an excellent and widely-read blog! Do you happen to know the words prichlenennaya, yamchata, vyvetrelaya, razloman or tulovishchnykh? No, but I'll look them up in my dictionary about 10 hours from now. prichlenennaya: not in my "pocket" dictionary, but the root of the word means "member". yamchata: not there either, but most likely related to yama, "pit/cave", so "pitted". tulovishchnykh: "of the trunk _", so I bet the next word is "(of the) vertebrae".